My son had to read a book and complete a book report. Not just any book report, mind you. A book report that involved something other than writing. He had to take a plastic pumpkin, and make it look like a character from his book! At least that is what I said. A book report is relatively easy at the first grade level, with minimal insight required. Zane can do those in his sleep, unless he didn't read the book, which sometimes happens. But a book report that involves actual craftiness? Zoinks! I believe that I've mentioned my poor crafting abilities. But Zane picked The Monster at the End of This Book, and that helped tremendously. It's one of the best children's books ever written, in my opinion, so Zane and I have read it quite a bit. We discussed the "inner" aspects of the character of Grover for a bit, vs. the "outer" aspects, such as fur color. Zane wrote his thoughts down in typical report format. Then we got to work. We got a plastic pumpkin from the store, and about a yard of blue fleece. I wrapped up the pumpkin in the blue fleece. I'd like to be able to say that I did some actual math and figured out the circumference of the pumpkin and cut everything just so. That would be lying, however. Instead, I bunched up everything at the top, secured it with twine, and then started hacking off bits of blue until I decided it was decent. Zane went with his dad to the crafts store to pick up the rest, including some black felt, googly eyes and a pink pom pom for the nose. And Voila! Grover is born. Of course he's just a head, so likely he'd be terrified, but still...not bad. I hope that we get an A. That is a lot of pressure for a first grader, I mean parents, I mean first grader! I love how it turned out! I think you earned your crafty scout badge on this one! 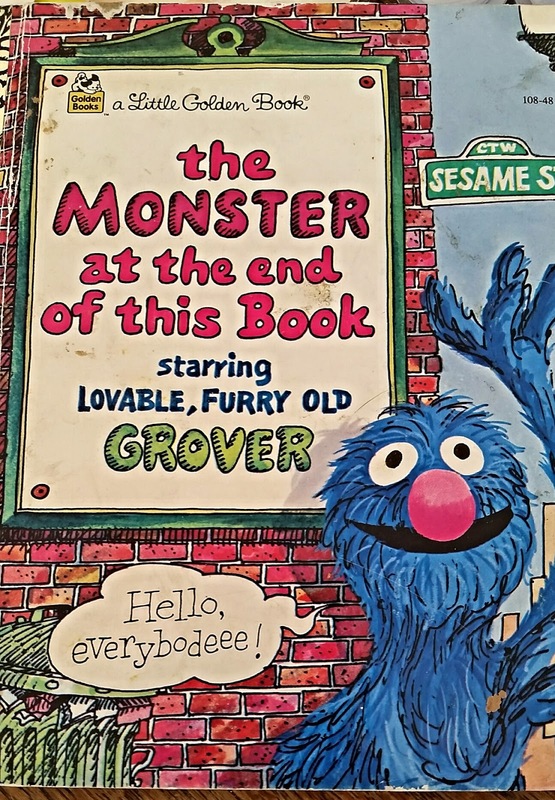 I remember this book from my DD's reading days. 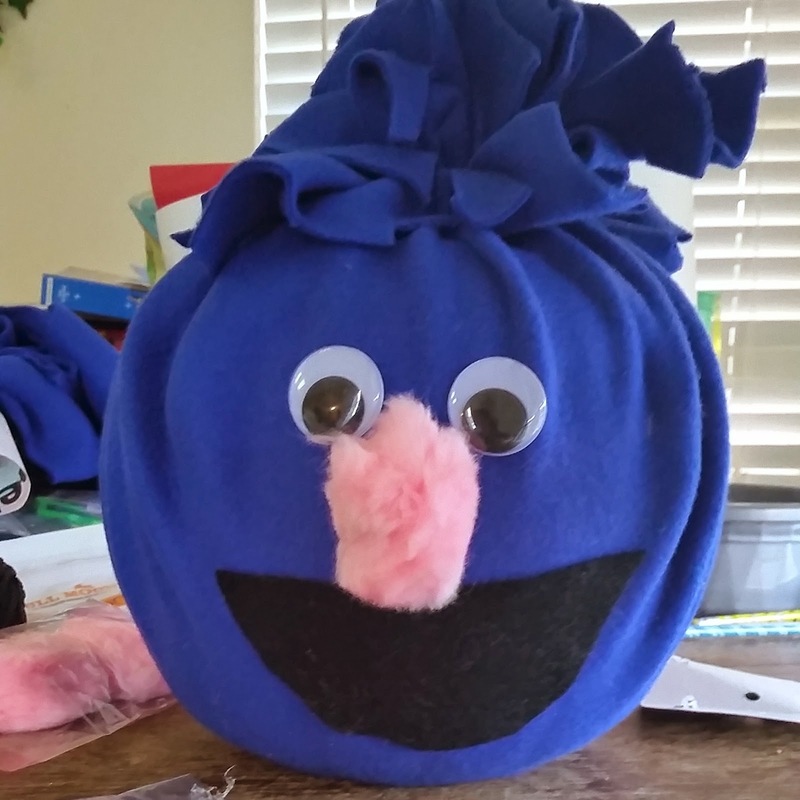 Your Grover from a pumpkin is adorable, This is the 2nd blog I have seen this week with this assignment.